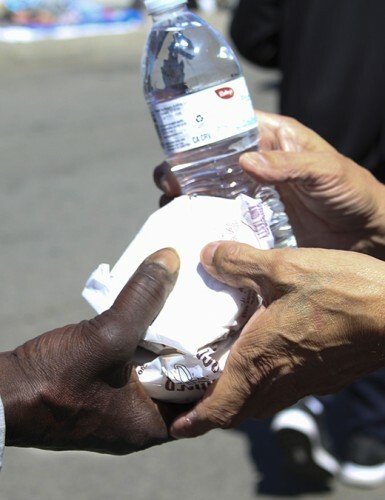 An American River College student helped local actor Sosa Hernandez hand out food to the homeless near Loaves & Fishes, a local nonprofit that provides daily meals and shelter to those in need, in Sacramento on Saturday. Vince Blake, president of the newly formed Film Club, was thankful for the opportunity to be involved with helping the homeless that Hernandez provided him. Blake, 19, who had been looking for an opportunity to help the homeless since high school, helped Sosa hand out McDonald’s hamburgers and bottled water to the people living in small tent camps up and down Ahern Street just north of downtown. Hernandez has built a rapport with this small community of homeless people in the area after about three months of coming out on “most every” Saturday and passing food out from the back of his Range Rover. Randy Horn had mainly worked as a non-union laborer and is “trying to get it together” after being homeless for about a year. He usually gets a spot to sleep at a nearby mission and when he can’t, looks for a friend that has a concrete slab where they can pitch their tents. Byron Burnett has been homeless for about four to five months. He mainly sleeps on the sidewalks of Ahern Street and North B Street. Blake also said he enjoyed the ease of being able to get involved and help. Blake hoped to have other members from the Film Club come help give food away but because there was short notice, no others could make it. 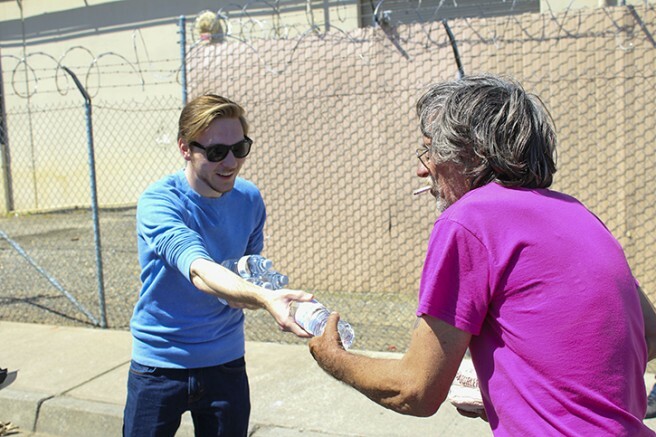 Be the first to comment on "ARC student helps local actor feed the homeless"